Market State 12A - Transitional/Bear: The Portfolio Thermostat has been in one of the “Transitional/Bearish” Market States for the last 92 trading days, beginning on August 20, 2015 when the Portfolio Thermostat shifted to Transitional - Market State 6. The next day, August 21, 2015, the market environment move to Transitional/Bearish Market State 12A. 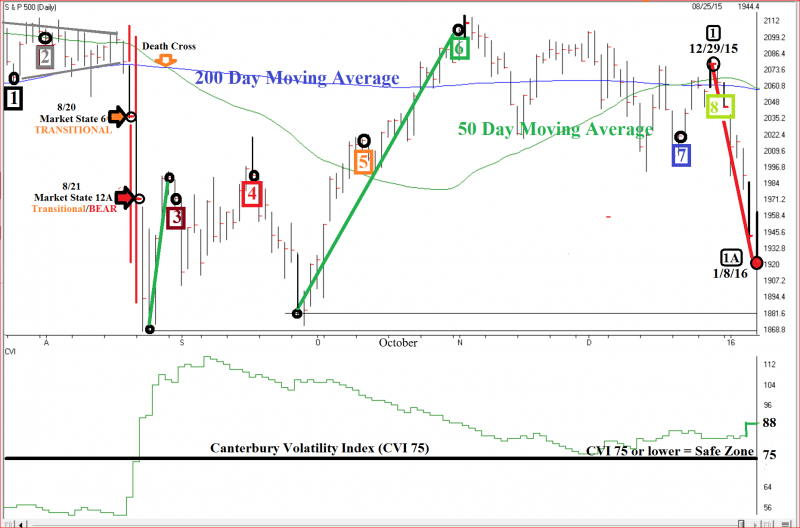 Canterbury Volatility Index (CVI 88) – Bearish: Volatility, as measured by the CVI, increased by 3 points last week, which was enough to move the Portfolio Thermostat’s volatility indicators from “caution” to a “negative” reading. Overbought/Oversold indicator (95% oversold): Short-Term Bullish. Last week’s 87% overbought reading (short-term Bearish) made an abrupt change as a result of the sharp decline. An “oversold” (bullish) reading of 95% or higher is considered to be an extreme level. The U.S. equity markets just experienced the worst opening for a new year in history. The first week of the New Year saw the Dow drop 1,079 points (6.2%). The S&P 500 was down 122 points (6.0%), while the NASDAQ 100 dropped 7.3%. Globally, the MSCI World Index was minus 6.2% and the Emerging Markets Index was down 6.8%. Meanwhile, the Canterbury Portfolio Thermostat finished the week basically unchanged. Effective risk and portfolio management calls for its own thermostat process to manage the correct combination of securities that will create a stable portfolio throughout changing market environments. Our portfolio has not had a single day with more than a 1% fluctuation, up or down since late last August. The Portfolio Thermostat’s “model portfolio” has not had a peak to trough decline exceeding 3% since September 1, 2015. How did the Portfolio Thermostat manage to avoid last week’s market plunge? As you will recall from last week’s update (January 4th, 2016): The Canterbury Portfolio Thermostat adjusts its ETF holdings to match the current bearish Market State environment. The portfolio currently holds “inverse” ETFs. The time to adjust portfolio holdings, in order to maintain portfolio stability, was NOT last week, a month or three months ago, but much earlier. The Portfolio Thermostat’s algorithms had begun to make the necessary adjustments in its ETF holdings since the end of August. 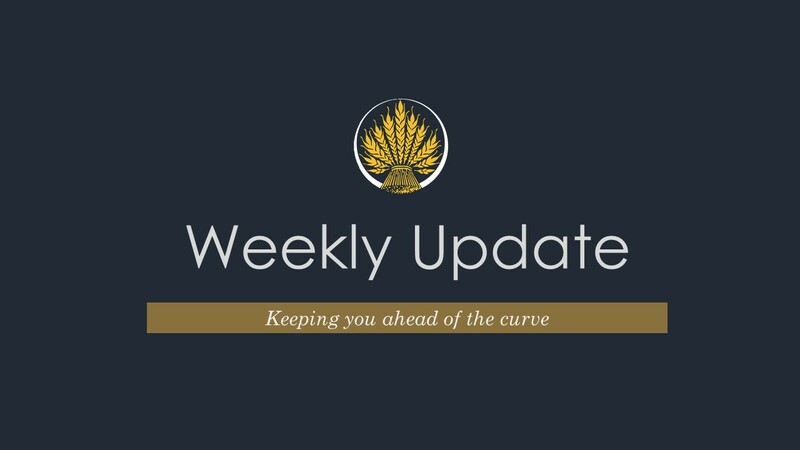 The following is a recap of some of our Weekly Updates over the past six months, outlining the readings from the Portfolio Thermostat’s indicators that allowed us to be in the position we are in now. Market State 1. The Portfolio Thermostat has several “early warning” indicators built into its algorithms. At this time, we are just beginning to see some very early cracks in the wall of the US equity markets…It will take more time and further confirmation to determine if there will be a significant change in leadership among our universe of over 170 diverse Exchange Traded Funds (ETFs). Market State 2. Narrow trading ranges are typically resolved by a decisive break one way or the other. Things should begin to liven up soon. Last week, I warned readers by saying: ‘This is the kind of market environment that the risk of getting whipsawed is much higher than transitioning straight into a bear market.’ That is exactly what happened, when the S&P 500 rallied back +6.43% on Wednesday and Thursday last week. Market State 12A. Canterbury’s studies show that a transition from a bull to a confirmed bear market doesn’t happen overnight; it is a process. Market State 12A. Yesterday’s 390 point Dow advance is NOT characteristic of a sustainable market turnaround. The 300 plus point days rarely occur during bull markets. Market State 11A. The current advance has done very little to improve the current bearish market environment. The S&P 500 remains well below the 200 day moving average (DMA) and the Death Cross remains intact (the 50 DMA is below the 200 DMA)…There is a huge amount of overhead supply that represents sellers who would like to sell as they get back to breakeven. Market State 7A. Parabolic short-term advances are NOT important to long-term investors…The only advance that matters is one that registers a new high in your portfolio. The only decline that matters is one that exceeds a normal correction (10%). There is no reason to believe that the major markets will hold their short term gains. Expect the short term markets to look very different, from what we have seen over the last month. Market State 8A. So far, the highest peak-to-trough decline (drawdown) has been 12.4%. The current maximum decline is 7% less than 2011’s low. That being said, the current “Transitional/Bear” has yet to show any meaningful indications of nearing an end. In other words, the current Transitional/Bear will last longer than the one in 2011 and will most likely have more downside to come. You do not need to be a market technician to see the bearish shift in the long-term trend. As we can see, the current Transitional/ Bearish Market State environment, the first one since 2011, is proving to be difficult for traditional portfolio management strategies. Bear markets are volatile and will have periodic rallies, like the one in October. As is typical of bear market rallies, it occurred when most would have least expected it, then gave it all back over the next few weeks. The Portfolio Thermostat will rarely participate in these fleeting bear market rallies. This, however, should not be cause for concern. The Portfolio Thermostat’s main objective is to provide portfolio stability, which means that it will not participate in the quickly dissipating gains of these rallies but neither will it be as vulnerable to bear market downturns that are so difficult to recover from.